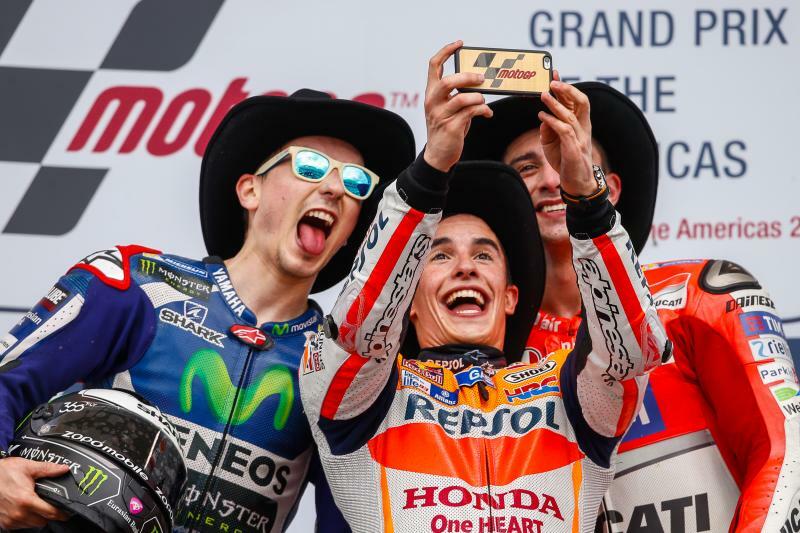 Marc Marquez took little notice of a number of falls behind, cruising to a fourth win in Texas ahead of Lorenzo and Iannone. All eyes were on Marc Marquez (Repsol Honda Team) as the MotoGP™ World Championship lined up at the head the grid for the Red Bull Grand Prix of The Americas. The Spaniard went into the race with a perfect record on America soil; winning every MotoGP™ race he had started in the United States. While Marquez was quietly confident, there were a number of riders who were looking to return to the front once more. Amongst them was Jorge Lorenzo (Movistar Yamaha MotoGP), the 2015 MotoGP™ World Champion having suffered an uncharacteristic crash during Warm Up. Andrea Iannone (Ducati Team) was another ready to make an impact, having qualified fourth; he started in seventh after his penalty from the Argentina GP. All of the factory Yamaha and Ducati riders opted for medium tyres front and rear while pole-man Marquez chose the soft front with medium rear. The Circuit of the Americas has always been a challenging circuit for tyres and all who lined up knew that their choice on the grid would make a significant difference. Roaring off the line, Lorenzo grabbed the lead into Turn 1 but ran wide on exit, allowing Marquez to move ahead. The field all made it through the opening corners safe, Lorenzo in second with Valentino Rossi (Movistar Yamaha MotoGP) hot on his tail. Andrea Dovizioso (Ducati Team) also made a good start and used the power of the Ducati to slide into second down the back straight. As Dovizioso came through, so too did Aleix Espargaro (Team Suzuki Ecstar), the Spaniard finding himself in fourth at the start of the second lap after starting in ninth. Espargaro had gone against the norm and opted for soft front and rear, the extra grip giving him a clear advantage in the opening laps. For the third race in a row, Loris Baz (Avintia Racing) would crash at Turn 1. The third lap began with Rossi crashing out of the race at Turn 2, losing the front mid corner. All the while Marquez and Dovizioso ran away at the front, Lorenzo defending his third place position. For the first time in 25 races, Rossi failed to finish in the top five. Marquez continued to hammer home his advantage, leading Dovizioso by a second midway through the fourth lap of the race. Action intensified further down the field as Maverick Viñales (Team Suzuki Ecstar) attempted to make up for a poor start to the race, battling hard with Scott Redding (Octo Pramac Yakhnich). Lap after lap, Marquez extended his lead and after only five laps his fourth straight win in Texas looked certain. But the remaining two spots on the podium were wide open, Lorenzo getting past Dovizioso with Dani Pedrosa (Repsol Honda Team) waiting patiently behind. After a strong start, Aleix Espargaro began to drop back and soon Andrea Iannone passed him. At the start of the seventh lap Pedrosa had a huge moment on the front end going into Turn 1, losing control of his Honda and ploughing into Dovizioso. For the second race in a row, another rider would take down Dovizioso. Pedrosa would be able to re-join, but Dovizioso’s race was over, the Italian leaving the circuit distraught but fortunately without major injury. At Turn 11 on lap eight both Cal Crutchlow (LCR Honda) and Bradley Smith (Monster Yamaha Tech 3) fell off as the crashing continued. Each was able to remount the race but the leading four now had huge gaps between them, separated by at least three seconds. All the falls had also promoted Iannone to a provisional podium in third place. The Team Suzuki Ecstar duo meanwhile continued to dice it out for fourth place, Viñales also running the softer rear but had opted for the medium front, which gave him increased braking stability. Chaos unfolded behind, but Marquez remained cool, calm and collected as he upped his pace to the 2’04s, almost half a second faster than Lorenzo’s laps. Each lap saw Marquez set a new fastest lap of the race. None of the top three were able to make major progress on the rider ahead, unlike the Suzuki pair who continued to slug it out. Viñales would dive up the inside, only to have Espargaro come back past him soon after. With ten laps to go, Dani Pedrosa would pull into the pits as his bike was too damaged to continue. In a true sign of sportsmanship, Pedrosa went to the box of Dovizioso to apologise for the incident and explain that it was not intentional. The rhythm of the race continued, Viñales now a second clear of his teammate as all of the top seven riders were spread out on track. Even though he was now over six seconds ahead of Lorenzo, Marquez’s pace remained over half a second faster as he asserted his dominance at the Circuit of the Americas with each lap. As many had predicated, Marquez walked to victory and crossed the line 6.107s ahead of Jorge Lorenzo. For just the second time in his career, Lorenzo takes to the podium at COTA as he ended the race second. Andrea Iannone rounded out the podium with a safe ride to third place. Maverick Viñales secured his best ever premier class finish with fourth ahead of his teammate Aleix Espargaro, a great day for Suzuki with a double top five. Scott Redding, Pol Espargaro (Monster Yamaha Tech 3), Michele Pirro (Octo Pramac Yakhnich), Hector Barbera (Avintia Racing) and Stefan Bradl (Aprilia Racing Team Gresini). As the Championship returns to Europe, Marquez leads with 66 points a solid 21 points clear of Lorenzo in second. After failing to finish the Americas GP, Rossi slips to third with 33 championship points as clear gaps are already emerging.